Whether you are monitoring the molecular basis of disease, or developing efficient drug delivery systems, targeted therapies and surgical contrast agents, explore molecular probe imaging with quantitative near-infrared detection. Imaging probes and agents conjugated to fluorescent IRDye® infrared dyes have propelled more than 20 Phase I and Phase II clinical trials worldwide. Time to take a closer look at this propelling technique and solutions. LI-COR's IRDye NIR fluorophores are ideal to convert your targeting molecules into reporter-labeled probes and agents. IRDyes get you sensitive and consistent detection for in vitro and in vivo use. Use of IRDye infrared fluorescent dyes and near-infrared (NIR) fluorescence imaging deliver enhanced sensitivity due to low background autofluorescence in the near-infrared region and, therefore, higher signal-to-noise ratios. 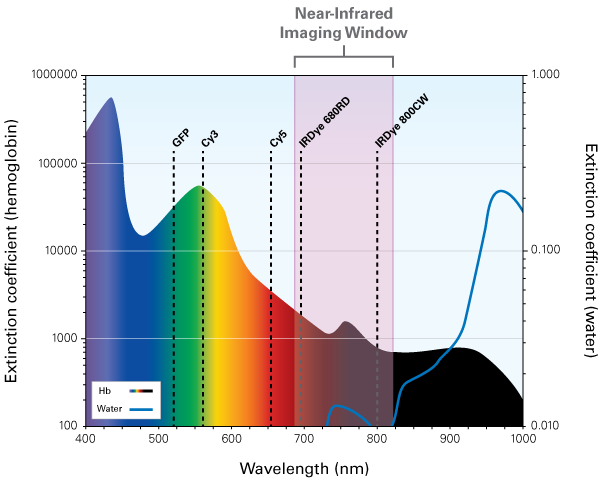 IRDye fluorescent dyes have absorption and emission wavelengths in the NIR spectrum, between 680 and 800 nm. There are various IRDye NIR fluorophores you can choose from, suitable for your research application of choice. Available IRDye NIR fluorophores. Click to enlarge. Among the fluorophores that we've used, the LI-COR dye, IRDye® 800CW seems to provide the ability to detect the tumors while maintaining suitable pharmacokinetics for use in vivo. It has worked quite well with our preclinical models. IRDye NIR fluorophores can be covalently conjugated to antibodies, nanoparticles, peptides, and other targeting molecules. IRDye reactive dyes bear an N-hydroxysuccinimide (NHS) reactive group that couples to free amino groups and forms a stable conjugate. Proteins other than IgG antibodies can also be labeled. Labeling is based on a simple conjugation protocol that uses fast, spin column cleanup with resulting purity equivalent to purification by dialysis. Simply dissolve the protein in the provided buffer, combine it with the appropriate amount of water soluble amine-reactive IRDye, and separate the labeled conjugate from the free dye using included spin columns. Labeling and purification are complete in approximately 2 hours. The ability of these dyes to clear in animals allows consistent imaging agent assessments, in vitro and in vivo. Validate your molecular probe’s biological performance in vitro, in vivo, and ex vivo with Odyssey CLx and Pearl Small Animal Imaging Systems. Screen for specificity and binding affinity with in vitro cell-based assays, then move your ‘hits’ to animal studies with confidence. In vitro assays like In-Cell Western assays and On-Cell Westerns provide a convenient first step in assessing probe specificity and binding affinity to targets in cells. Evaluate the big picture pharmacology with biodistribution and clearance studies in vivo, then get one step deeper. In vivo characterization monitors biodistribution, specificity, and clearance of the dye-conjugated probe in small animals. In vivo evaluation of imaging probes using Pearl Small Animal Imaging System. Measure uptake and localization in tissues and organs ex vivo for a complete workup. Ex vivo analysis reveals the biodistribution and localization of the probe in organs and tissues excised from treated animals at macroscopic and microscopic levels.